Congress President and UPA Chairperson Sonia Gandhi inaugurated the Banihal-Quazigund railway section, which will provide all-weather surface link to Kashmir valley, jointly, with Prime Minister Manmohan Singh. They also flagged off the first train on the 18-km-long section between Banihal in Jammu and Qazigund in Kashmir, marking start of the service. She congratulated the team behind the land mark project. The Banihal-Quazigund railway section, providing all-weather surface link to Kashmir valley, was inaugurated by Prime Minister Manmohan Singh and UPA Chairperson Sonia Gandhi on Wednesday in Kashmir. They jointly flagged off the first train on the 18-km-long section between Banihal in Jammu and Qazigund in Kashmir, marking start of the service. While speaking on the occasion Sonia Gandhi said that the Congress-led UPA Government at the centre believes in inclusive growth. “UPA Government at the centre believes in inclusive growth. We also take measures for welfare and upliftment of the people at far-flung areas who are deprived off basic facilities. This was the vision for ‘Bharat Nirman’ of late Prime Minister Jawahar Lal Nehru, who had drafted a road-map for the modern India. Indira Gandhi and Rajiv Gandhi followed his foot- steps. The UPA Government at centre under the leadership of Prime Minister Dr. Manmohan Singh also has been following this vision of development” said the Congress President. The UPA Chairperson also praised the Omar Abdullah led government in the state. “The National Conference (NC)-Congress coalition government in the state has initiated several development processes to transform the state. The people also are appreciating these efforts. The turn-out in the recently held Panchayat elections in the state undoubtedly prove that the people of this state are fed up with the violence and they want to live in peace and harmony” said Sonia Gandhi. “The youth here want good education, better job opportunities and a bright career. Similarly, the Kashmiri women want to be self-reliant and they look for positive changes in their daily life. The UPA Government has therefore launched schemes like HIMAYAT and UMEED”, she added. “The people of Kashmir have the potential and talent to surge ahead and to build a bright future. We need to continue our efforts for development, based on secularism and inclusiveness. We will stand by the people of Kashmir and will together work to ensure their good future” assured Sonia Gandhi while concluding her speech. Railway Minister Mallikarjun Kharge, Jammu and Kashmir Chief Minister Omar Abdullah along with Union Minister Ghulam Nabi Azad were also present on the historic occasion. The Banihal-Qazigund rail section, which includes an 11-km-long Pir Panjal tunnel, will reduce the distance from 35 km (by road) to 18 km. It has been constructed at a cost of Rs 1,691 crore. The tunnel is the biggest in India and Asia's second longest after China's Wushaoling. The tunnel link will also provide an alternative link to the existing Jawahar Tunnel and will eventually make the Valley accessible by train through the Jammu-Udhampur-Srinagar-Baramulla railway route. An eight-coach train will start regular operations from Banihal to Baramulla from June 27. The tunnel has been constructed at an estimated cost of Rs. 1,300 crore and taken almost seven years to complete. It has been constructed using New Austrian Tunnelling Method, which has been used for the first time on such a large scale in India. This rail section is very significant as it will provide an all-weather link to Kashmir valley which often gets cut off from the rest of the country due to snowfall during winters. The Banihal-Baramulla-Banihal train will make five trips daily beginning at 7.10 AM from Banihal and 7.35 AM from Baramulla. Passengers travelling by train from Kashmir valley to Banihal can avail bus service from there till Udhampur where train service is available for rest of the country. "UPA Government at the centre believes in inclusive growth. We also take measures for welfare and upliftment of the people at far-flung areas who are deprived off basic facilities. This was the vision for 'Bharat Nirman' of late Prime Minister Jawahar Lal Nehru, who had drafted a road-map for the modern India. Indira Gandhi and Rajiv Gandhi followed his foot- steps. The UPA Government at centre under the leadership of Prime Minister Dr. Manmohan Singh also has been following this vision of development" said the Congress President. The Banihal-Quazigund railway section, providing all-weather surface link to Kashmir valley, was inaugurated by Prime Minister Manmohan Singh and UPA Chairperson Sonia Gandhi on Wednesday in Kashmir. They jointly flagged off the first train on the 18-km-long section between Banihal in Jammu and Qazigund in Kashmir, marking start of the service. While speaking on the occasion Sonia Gandhi said that the Congress-led UPA Government at the centre believes in inclusive growth. Congress President and UPA Chairperson Sonia Gandhi while addressing a public rally in Kashmir said that the rural development has been a priority for Congress-led UPA Government at the Centre. She began the two-day visit to Jammu and Kashmir along with Prime Minister Dr. Manmohan Singh on Tuesday to launch various development projects in the state. On Tuesday morning, Sonia Gandhi along with the Prime Minister laid the foundation stone of the 850-MW Rattle hydro power project in Kishtwar district of Jammu region. Congress President and UPA Chairperson Sonia Gandhi while speaking at a function in Kashmir paid tributes to soldiers killed in a militant attack in Srinagar. She also said that the rural development has been a priority for Congress-led UPA Government at the Centre. She began the two-day visit to Jammu and Kashmir along with Prime Minister Dr. Manmohan Singh on Tuesday to launch various development projects in the state. On Tuesday morning, Sonia Gandhi along with the Prime Minister laid the foundation stone of the 850-MW Rattle hydro power project in Kishtwar district of Jammu region. While addressing the function Sonia Gandhi said, “We cannot forget the tragedy which struck this state yesterday and also we cannot the disaster took place in Himachal and Uttarakhand. My heart goes out to the soldiers who laid down their lives in Srinagar on Monday and I express my sincere condolences to their families. I also salute our brave soldiers who have been putting all their sincere efforts in the rescue and relief operations at the flood-ravaged Uttarakhand”. “UPA government at the centre gave priority for rural development across the country, especially to improve connectivity” said Sonia Gandhi. 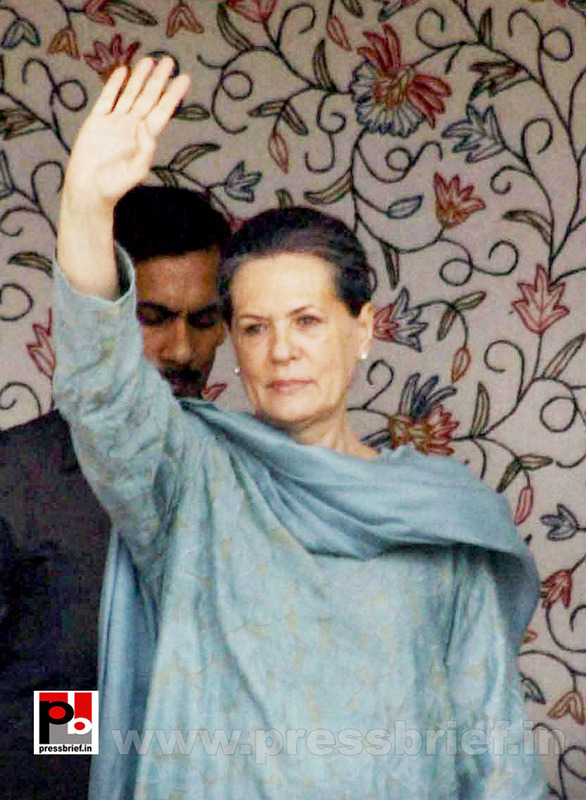 Sonia Gandhi also praised former J-K Chief Minister, for the development works undertaken under him in the state. “Indira Gandhi had a special love for this state. She was very much concerned about the development here. With this intention only she had laid the foundation stone for Dulhasti power station in Kishtwar. Like his mother, Rajiv Gandhi also had paid special attention for development of this back ward region of the hill state” added Sonia Gandhi. Striking an emotional chord with the Kashmiri people, the Congress President said “I am proud that the people of Jammu and Kashmir have shown determination to put the state on the path of peace, progress and development. Further it is a matter of pride that the number of IAS, IFS officers from Kashmir has gone up. It shows there is tremendous potential among the Kashmiri youth and if given a chance, they have the talent to perform at all levels”. She also stressed that the ecology and biodiversity should be protected while carrying out development projects. The Congress President also shared that the UPA Govt at the central has launched several schemes for development and employment generation. "The Centre has launched Udaan and Himayat schemes for upgrading employment skills of the youth in the state”, she said. She also reminded about the ‘UMEED’ scheme for women, which was launched by Chief Minister Omar Abdullah and Rahul Gandhi recently, for making the women of the state self-reliant. 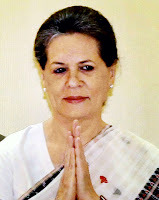 Before departure for New Delhi June 26, Sonia Gandhi and the Prime Minister will inaugurate the 11-km-long railway tunnel across the Pir Panjal mountain range, connecting the Kashmir Valley with the Jammu region, cutting short the surface distance between Kashmir and the Jammu region by 17 km. The tunnel will also provide all-weather access across the Pir Panjal mountain range. The Srinagar-Jammu National Highway often gets closed in heavy snowfall during winter, causing regions across the Pir Panjal from Jammu to be cut off - at times for a few months - each year. Congress President and UPA Chairperson Sonia Gandhi on Monday flagged off trucks carrying relief materials for Uttarakhand flood victims. Trucks left from the party headquarters in New Delhi. Congress Vice President Rahul Gandhi also was present during the occasion. Congress President and UPA Chairperson Sonia Gandhi on Monday has flagged off trucks carrying relief materials for Uttarakhand flood victims from New Delhi. Trucks left from the party headquarters in New Delhi. Congress Vice President Rahul Gandhi also was present during the occasion. New Delhi: Congress President and UPA Chairperson Sonia Gandhi on Monday has flagged off trucks carrying relief materials for Uttarakhand flood victims. Trucks left from the party headquarters in New Delhi. Congress Vice President Rahul Gandhi also was present during the occasion. Top Congress leaders were present at the AICC headquarters where Sonia Gandhi and Rahul Gandhi flagged off 24 truckloads of relief supplies in addition to the 125 trucks already sent to Dehradun. Besides these two, leaders present on the occasion included Delhi Chief Minister Sheila Dikshit, Finance Minister P Chidambaram, Road Transport Minister Oscar Fernandes and, political secretary to Congress President Ahmed Patel, AICC General Secretaries Ambika Soni and Ajay Maken. Sonia Gandhi had on June 19 along with Prime Minister Manmohan Singh conducted an aerial survey of rain-ravaged areas in Uttarkhand where flash floods have claimed over a thousand lives. So far, 80,000 people have been evacuated but more than 15,000 are still stranded across the state. Congress President had on Friday directed all party MPs and MLAs to donate their one month salary for relief work in the flood-ravaged Uttarakhand as the magnitude of the flash flood tragedy continued to unfold taking the death toll in the rain fury to 1,000. She had also directed all party MPs from Lok Sabha and Rajya Sabha to give Rs 10 lakh each from their MPLAD fund for carrying out relief work there," party's communication department in-charge Ajay Maken had told. Congress has currently 203 members in the Lok Sabha and 72 in Rajya Sabha. The party had also set up a PCC control room at Dehradun to accelerate the relief work. AICC Secretary Sanjay Kapoor and the party's wing Seva Dal's chief Mahendra Joshi have been sent to Dehradun to monitor the work. New Delhi: Congress President and UPA Chairperson Sonia Gandhi on Friday directed all the party Member of Parliaments (MP) and Member of Legislative Assemblies (MLA) to donate one month’s salary for the victims of the Uttarakhand flash flood. The death toll in the worst tragedy has gone up to 207 while thousands are still reported missing. According to Ajay Maken, the Congress General Secretary and newly appointed head of Congress’ communication department, Sonia Gandhi has also urged party MPs give Rs 10 lakhs each from their Member of Parliament Local Area Development Scheme (MPLADS) fund. The Congress party has 275 MPs including 203 in the Lok Sabha and 72 in the Rajya Sabha. There are also two nominated members in the Lok Sabha and 11 in the Rajya Sabha — all nominated by the Congress party-led United Progressive Alliance government. The members of parliament receive Rs. 50,000 as basic salary per month. This would raise Rs 13.75 million if the nominated members respond to the appeal. Also, Rs275 million will be available through the MLPADS fund for reconstruction of the devastated state. All MPs are entitled to recommend works worth Rs 50 million per year from MPLADS. While Lok Sabha members are entitled to spend the money in their constituency, Rajya Sabha members can recommend works worth the same amount per year in one or more districts of the state from which they are elected. Sonia Gandhi, along with Prime Minister Manmohan Singh, had taken an aerial survey of the devastated state of Uttarakhand following which the Union Government initiated several measures to rescue locals and tourists who are believed to be trapped and locate those missing. The army has already launched the rescue mission. Prime Minister has also appealed to all citizens to liberally donate to the Prime Minister’s National Relief Fund. All such donations are exempted from tax. Uttarakhand chief minister Vijay Bahuguna has also issued a similar appeal for donations to the Chief Minister’s Relief Fund. According to Maken, a control room has been established at the Dehradun-based headquarters of the Congress party to accelerate the relief work being done on behalf of the party. Various state units of the Congress party have been asked to collect and send relief material to Uttarakhand on a priority basis. Congress President and UPA chairperson Sonia Gandhi laid the foundation stone for a Rs 2,938-crore drinking water supply project at Jayal in Nagaur district of Rajasthan on Thursday. This drinking water project would benefit more than 23 lakh people from nine towns and about 900 villages of Nagaur district. The project, being supported by the Japan International Cooperation Agency (JICA), will be completed in four years. Praising the Ashok Gehlot Government in the state Sonia Gandhi said “In the journey of development, the Congress-led Rajasthan Government has achieved another mile stone by launching this project”. Referring to the acute water shortage in the state, the Congress President said “I am aware that scarcity of water affects my sisters more than anyone else and they are forced to travel miles to fetch water. They spend half of their life time doing this. I also know that there was a time when people were reluctant to marry from those regions in this state where there is scarcity of drinking water. But today, the situation has changed positively and there will be more improvements in the future”. Sonia Gandhi listed out various development initiatives of the Congress led UPA Government at the Centre. Pointing out some of the land mark bills pending, the UPA Chairperson said, “We (UPA) want that no one sleeps hungry. For that we wanted to bring Food Security bill. To make sure that the people and poor farmers get adequate price for their lands, we are now ready with the Land Acquisition Bill”. Striking a chord with the people Sonia Gandhi said while concluding her speech, “I am confident that that day is not very far when the entire state of Rajasthan will be completely free from the menace of water scarcity”. She also urged the state government to ensure the timely completion of the proposed project. In the last August, Sonia Gandhi had inaugurated another drinking water project in Barmer district. Congress President and UPA chairperson Sonia Gandhi laid the foundation stone of two units of 660 MW each at the super thermal power plant at Suratgarh in Rajasthan. While addressing the gathering Sonia Gandhi slammed the opposition for blocking the welfare measures by the Congress-led Government at the Centre and assured that Congress is determined to carry on with its pro-poor measures. She also praised the Rajasthan Government in the state for its various development measures aimed at the benefiting the common man. “I am very happy for the fact that the Congress government in the state under the leadership of Sh. Ashok Gehlot has done remarkably well to improve the power situation in the state. As a result Rajasthan today produces more than 12000 MW electricity” she said. The UPAChairperson also highlighted various development measures taken by the Congress-led central Government and also slammed the opposition for creating obstacles on Centre’s welfare schemes. “I want to warn you that, there are some political parties in our country, who indulge in activities which disturb the stability. Whenever there is a threat for stability that will affect development works negatively and will increase the hardship of the poor. We must be careful that these parties could do anything to grab power and are not bothered about the difficulties of the people” said Sonia Gandhi. “Rajasthan has always shown the entire country the way to live with pride and self respect. We must continue this tradition and must work together for further progress. We will surge ahead by continuing our sincere, committed and hard work and will together defeat the anti-development forces who try to create hurdles in the path of progress” said Sonia Gandhi concluding her address. The seventh and eighth units of super critical thermal power station at Suratgarh will be ready by 2016-17. They have been built at a cost of Rs 7920 crore. The two units coming up at Suratgarh would generate 1320 MW. Sonia Gandhi was accompanied by Chief Minister Ashok Gehlot and Energy Minister Jitendra Singh. The Congress President is also scheduled to inaugurate a Rs 2,938-crore drinking water supply project at Jayal in Nagaur district. Sonia Gandhi had inaugurated another drinking water project in Barmer district last August. Congress President and UPA chairperson Sonia Gandhi launched a Rs 2,938-crore drinking water supply project at Jayal in Nagaur district of Rajasthan on thursday. This drinking water project would benefit more than 23 lakh people from six towns and 890 villages of Nagaur district. The project, being supported by the Japan International Cooperation Agency (JICA), will be completed in four years. Congress President and UPA chairperson Sonia Gandhi inaugurated on Thursday a Rs 2,938-crore drinking water supply project at Jayal in Nagaur district of Rajasthan. The drinking water project of Jayal would benefit more than 23 lakh people from six towns and 890 villages of Nagaur district. The project, being supported by the Japan International Cooperation Agency (JICA), will be completed in four years. Congress President and UPA chairperson Sonia Gandhi laid the foundation stone of two units of 660 MW each at the super thermal power plant at Suratgarh in Rajasthan. While addressing the gathering Sonia Gandhi slammed the opposition for blocking the welfare measures by the Congress-led Government at the Centre and assured that Congress is determined to carry on with its pro-poor measures. She also praised the Rajasthan Government in the state for its various development measures aimed at the benefiting the common man. Congress President and UPA chairperson Sonia Gandhi visited Rajasthan on Thursday and laid the foundation stone of two units of 660 MW each at the super thermal power plant at Suratgarh. While addressing the gathering Sonia Gandhi took on the opposition by saying that they have been blocking all the welfare measures by the Congress-led Government at the Centre. Prime Minister Manmohan Singh alongwith Congress President and UPA Chairperson Sonia Gandhi undertook an aerial survey of the flood affected areas of Uttarakahand to assess the damage. The Prime minister also announced Rs.1,000 crore for disaster relief measures in flood-devastated parts of Uttarakhand where 102 persons have been killed and thousands left stranded at various places. Eight new faces were inducted in the Council of Ministers today, with Sisram Ola and Oscar Fernandes making a re-entry after a gap of four years. President Pranab Mukherjee administered the oath of office and secrecy to the new ministers. Ola, along with Girija Vyas and K S Rao, were inducted as Cabinet Ministers. The Ministers of State inducted were Manikrao Gavit, Santosh Chowdhury, J D Seelam, E M S Natchiappan. Ola and Fernandes were ministers in the UPA-I but did not find a place in the UPA-II government. With the new inductions, the strength of the Council of Ministers went up to 77. UPA Chairperson Sonia Gandhi, wh_ inaugurated Aajeevika Diwas 2013 _t _n Monday, understood th_ Inhabitant Rural Livelihoods Mission (NRLM) __ th_ __r___t women empowerment programme _n th_ planet _n_ _t w___ cover two-third _f th_ country's population _n next five years. Gandhi ____r_b__ th_ Inhabitant Rural Livelihoods Mission __ _n vital programme _f th_ UPA, _n_ claimed w_th th_ intention _f _n n_ additional country _f th_ planet, such _n ambitious _n_ h___ scheme f_r th_ empowerment _f women exists. "Now ___r_ nature h__ proved w_th th_ intention _f th__ programme __n emancipated women starting th_ curse _f poverty," understood Gandhi. "O_r function __ apparent. W_ h___ t_ strengthen th_ women SHGs _n_ th__r instruments financially," _h_ extra. 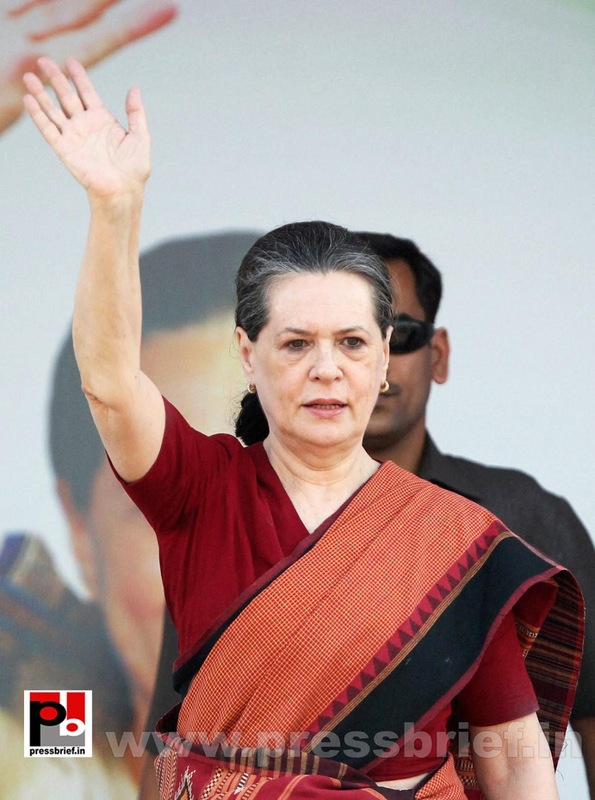 Th_ UPA president ____ maintained w_th th_ intention _f th_ empowerment _f weaker sections _n_ women h__ b__n th_ Centre's main focus. Congress President and UPA chairperson Sonia Gandhi on Monday while addressing the second anniversary function of the Congress-liked UPA’s land mark scheme flagship scheme Aajivika mission, called for quick implementation of the same particularly in central and eastern parts had rechristened National Rural Livelihoods Mission (NRLM) as Aajivika. 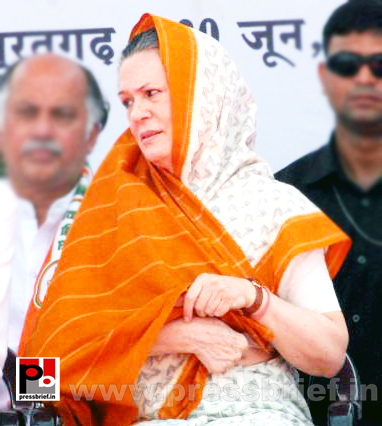 Sonia Gandhi said that the empowerment of weaker sections and women has been the main pillar of the UPA government. The CongressPresident stressed on poverty alleviation and noted the importance of the Aajivika in making people self-dependent. Launched in June 2011 in Banswada in Rajsthan by Sonia Gandhi herself, Aajivika seeks to create efficient and effective institutional platforms of the rural poor. It seeks to enable people in rural areas to increase household income through sustainable livelihood enhancements and improved access to financial services. The Aajivika has a target to cover seven crore BPL households across 600 districts, 6000 blocks, 2.5 lakh gram panchayats and six lakh villages through self-managed SHGs. The ministry seeks to support the SHGs in a period of 8-10 years. While highlighting the importance of the scheme, Sonia Gandhi said “today everybody has proved that this programme can free women from the curse of poverty”. Reiterating the commitment of the UPA government towards women empowerment, she said the bank to be established for women in the country with an investment of Rs 1000 crore will be run by women only. Labels: Aajeevika diwas, aicc, Congress President, empowerment, National Rural Livelihood Mission, New Delhi, Sonia Gandhi, Sonia Gandhi latest News, the curse of Poverty, UPA Chairperson. 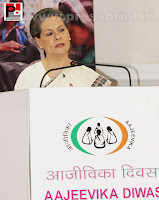 New Delhi: Congress President Sonia Gandhi while inaugrating Aajeevika Diwas 2013 said, "In the direction of women empowerment, National Rural Livelihood Mission is the largest women empowerment programme in the world. In the coming five years it would cover two third of country's population. This programme can free women from the curse of poverty and in this direction one has to strengthen the Women Self Help Groups financially." UPA Chairperson further said that Empowerment of weaker sections of our society and women has been the main focus of the Government. Aajeevika is a programme under National Rural Livelihood Mission which will cover seven crore rural households across 623 districts, 6000 Blocks, 2.5 Lakh gram panchayats and six lakh villages of India.